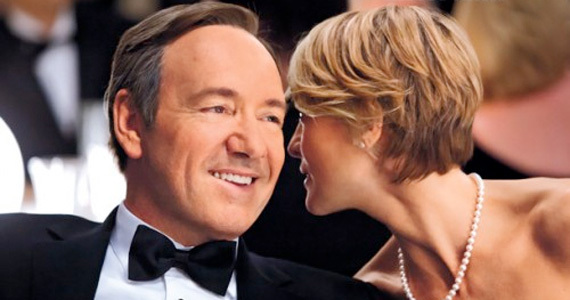 Check Out the Trailer For Netflix’s New Original Series ‘House of Cards’ Starring Kevin Spacey!!! Netflix has just unveiled its trailer for its first original series, ‘House of Cards’, a mega budget political drama series starring Kevin Spacey, with director David Fincher at the helm. ‘House of Cards’ is based on the British miniseries and follows a sinister Congressman, Francis Underwood (Spacey) and his wife Claire (Robin Wright) who stop at nothing to get what they want, and they want everything. The series will premiere on February 1st exclusively on Netflix, where all episodes will be available at once. Can’t wait to see how Netflix handles their first original series. I am hoping it will be HBO quality or AMC quality. Now, we need a trailer for Netflix’s new season of ‘Arrested Development’. Enjoy the trailer. Neve Campbell To Play Mystery Character in ‘House of Cards’!!! Season 2 of ‘House of Cards’ Has A Great Trailer!!! Dave Chappelle Planning New Show?!?! This entry was posted on Thursday, November 15th, 2012 at 11:18 am	and is filed under News, Television. You can follow any responses to this entry through the RSS 2.0 feed. You can skip to the end and leave a response. Pinging is currently not allowed. « Geek Deal of the Day! ‘Alien’ Anthology Blu-ray Set! Only $25.00!